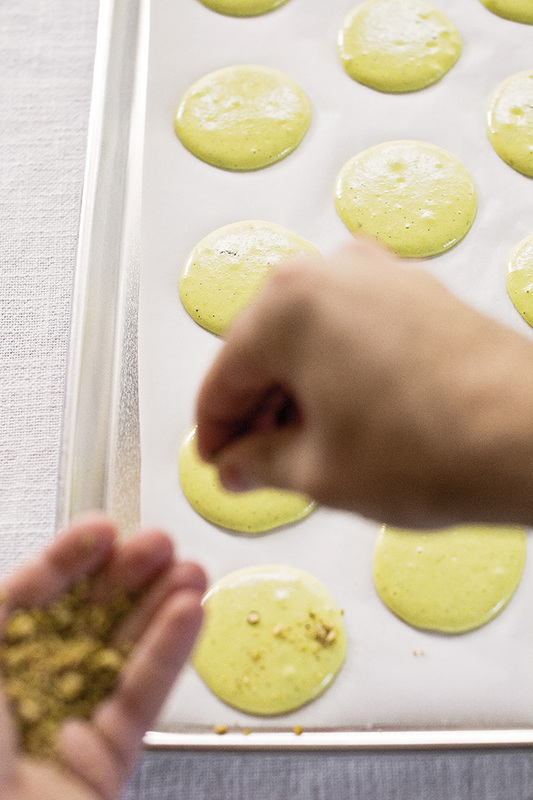 The goal of my experiments was to identify the recipe that produced the best macaron shells. Generally, bakeries use the same shell recipe for all their flavours (except for the addition of food colouring), and then create different macaron flavours by using unique fillings. In my tests, I made multiple batches of the same five recipes. Making multiple batches helped me understand how finnicky the recipes were while also ensuring that my findings were not skewed by an outlier. Since I did not want hundreds of macarons of the same flavour, each of my test batches had a different center. Taste-testers were instructed to focus on the texture and sweetness level of the shell rather than the filling. This was not difficult since, surprisingly, the recipes made macarons with very different texture profiles. Flavours were chosen independently of the shell recipes. 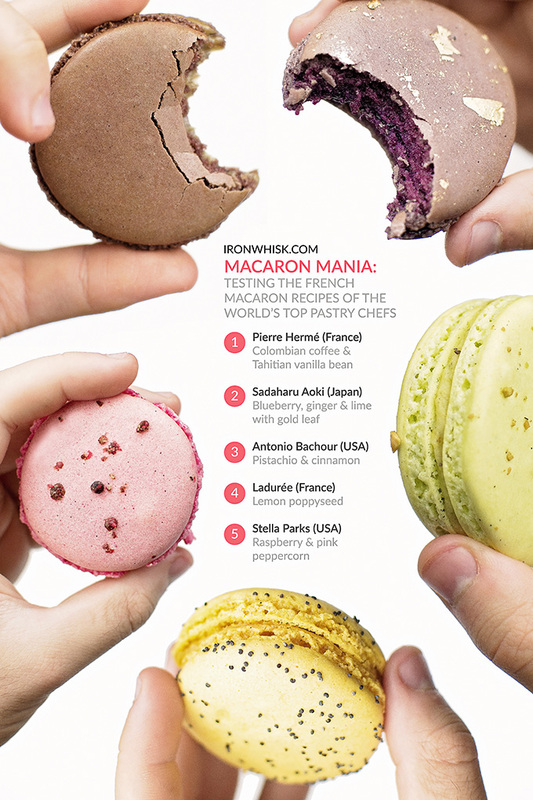 The only exception is Pierre Hermé’s macarons, which use his recipe for both the shell and the ganache center. The focus of my work was the shell, not the flavour. First, from France, I tried recipes from Pierre Hermé (Colombian coffee & Tahitian vanilla) and Ladurée (lemon poppyseed). These Parisian bakeries are known foremost for their macarons. Surprisingly, while world-famous pastry chef Pierre Hermé trained at Ladurée before opening his eponymous patisserie, his recipe (which uses the Italian meringue method) is noticeably different from Ladurée’s (which uses the French meringue method). When I first published my macaron tutorial in 2012, both bakeries were keeping their recipes secret. Now, since Pierre Hermé published Macarons and Ladurée published Macarons: The Recipes, they’re available to the public. Second, from Japan, I tested pastry chef Sadaharu Aoki’s recipe (blueberry, ginger & lime with gold leaf). Sadaharu Aoki, who takes an incredibly scientific approach to baking, is one of my favourite pastry chefs. His unique insights lead to remarkable results (see, for example, the éclair tutorial he inspired). Since his recipes are in Japanese, I once again had to find a translator to convert his video-taped instructions (here and here) to English. He only made his recipe public in 2013. From the United States, I made Antonio Bachour’s macarons (pistachio & cinnamon). 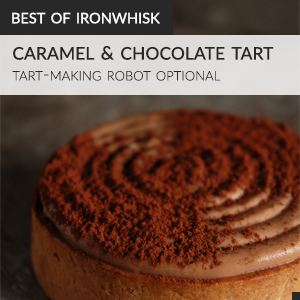 His creations are fantastic and I often use his recipes for the components of the pastries I share. I love his cookbooks, the first one published in 2013, so much. A few years back, I shared his macaron recipe. Of course, I also tested Stella Parks’ recipe (raspberry & pink peppercorn) as well. Indeed, it was the basis for the original macaron tutorial I wrote in 2012. Macarons were judged along multiple dimensions: what I call “the elements of the perfect French macaron”. The exterior needed to be smooth, shiny & perfectly circular. When bitten into, the shell had to only crack slightly rather than fall apart completely. Second, the interior had to not be hollow and, instead, slightly chewy. A ruffly set of “feet” at the bottom of each shell were a must. The macaron shell also had to not be too sweet to allow for a wide variety of fillings. The recipes tested, while varying in method, were similar in ingredient composition by mass. 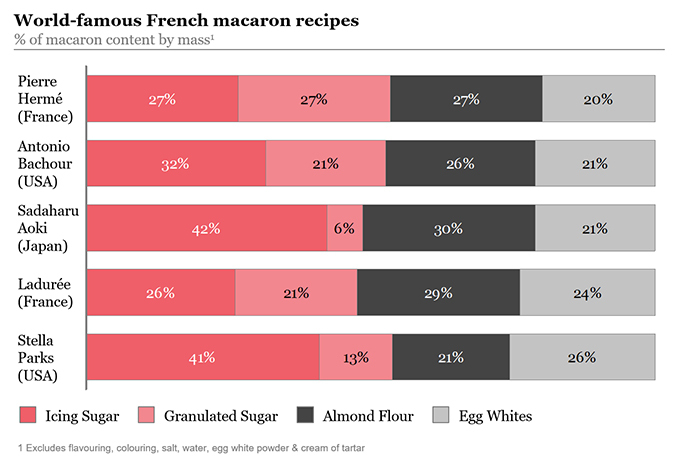 Across recipes, about 50% of the macaron shell is sugar, with the remainder split equally between almond flour (ground almonds) and egg whites. Different pastry chefs use a different split of icing sugar to granulated sugar (most notably Aoki uses almost entirely icing sugar). Some recipes add ingredients beyond sugar, almonds, egg whites, flavouring, and colouring to the shells. Parks adds a pinch of salt, while Aoki sprinkles in some dried egg white powder and cream of tartar. 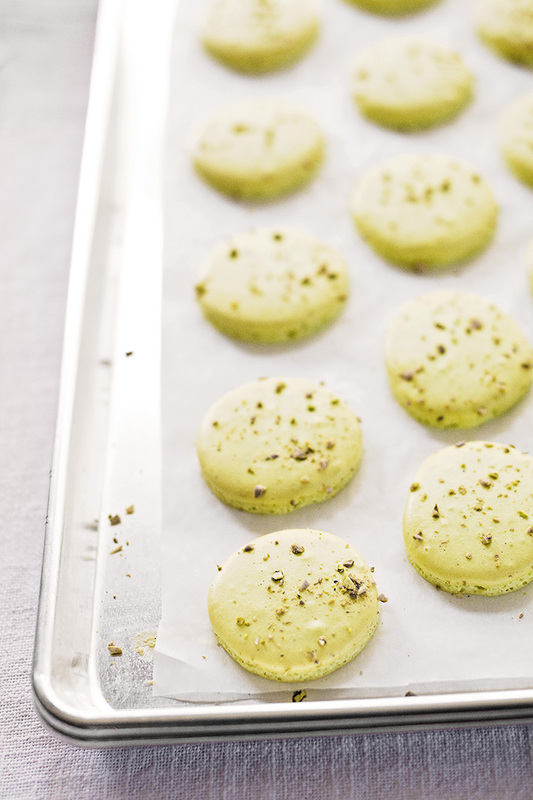 Bachour’s recipe is the closest to what I would describe as the “standard” macaron recipe. Bachour first separates the egg whites from the egg yolks a week ahead of time and lets them sit in a container in the fridge, covered with plastic wrap that holes are punched into. Letting the egg whites age weakens the proteins that compose them. He then brings the egg whites to room temperature, whips them to medium peaks, folds in sifted almond flour and icing sugar, pipes the macarons, hits the pan against the counter a couple of times to dislodge bubbles, lets the piped batter rest at room temperature to let the shells dry out a bit, and then bakes them. 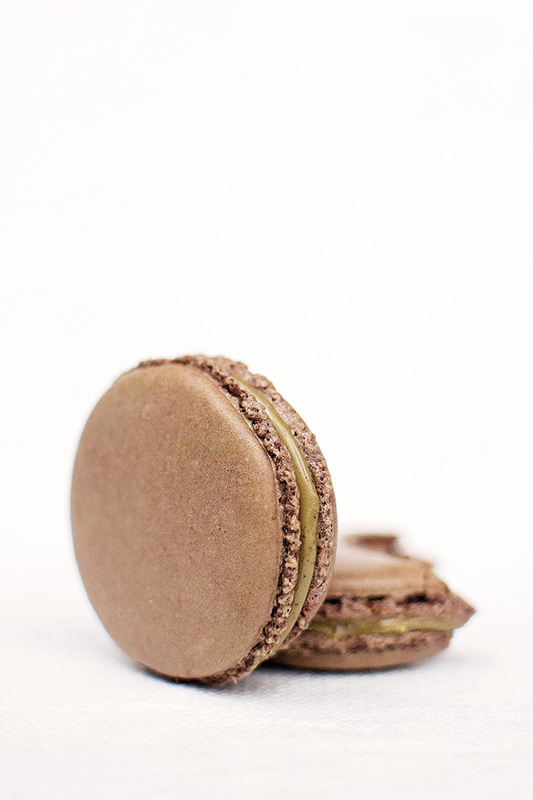 Bachour’s macarons have a lovely light crunch at the top layer of the shell that gives way to a dreamy, soft inside. The shell was not hollow and the feet were consistently the best developed of all recipes tested: tall and straight. They were, however, quite sweet. Aoki adds in dried egg white powder and cream of tartar to make a more stable meringue, but generally follows the same process as Bachour. (Except, as noted previously, he replaces some of the granulated sugar with icing sugar.) Aoki doesn’t comment on aging the egg whites, so I did not age the egg whites when preparing his recipe. 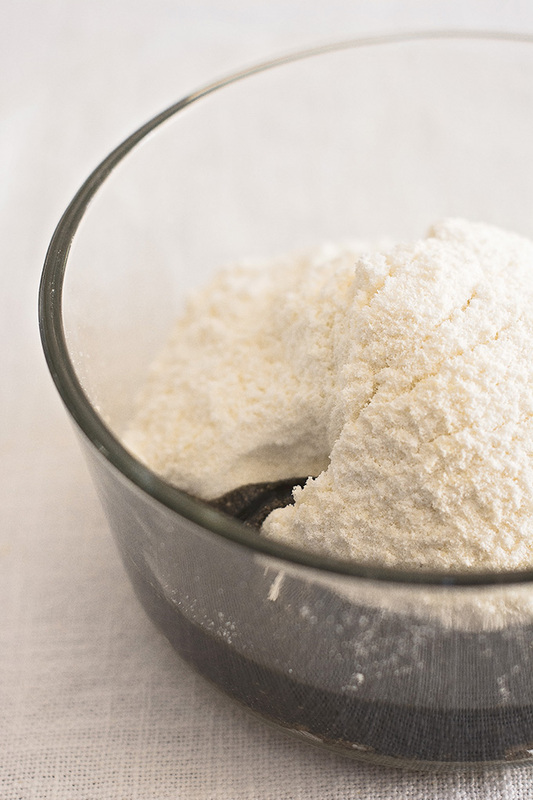 He does say, however, that bringing the egg whites to room temperature before whipping is important to ensure that the fats in the almond flour do not harden upon contact with the cold egg whites. Aoki taps the pans against the counter after piping, but does not let the shells dry out before baking. Aoki’s macarons ended up being the softest ones of those baked; I did not find the textural contrast sufficient. I did quite enjoy, however, the mellow sweetness level. I think both the texture and flavour difference that separates Bachour’s macarons from Aoki’s are a result of the higher percentage of icing sugar in Aoki’s recipe. These were not hollow, but the feet (while there) were not as well-developed as other recipes tested. I also found that the batter spread quite a bit, which makes piping perfect circles tough. Parks uses a similar technique as those described above. Like Aoki, she does not age the egg whites, taps the pans against the counter, and does not wait for the shells to dry before baking. Unlike Aoki, she beats the egg whites to very stiff peaks and folds in the almond flour and icing sugar all at once rather than in two stages. She also does not wait for the egg whites to come to room temperature. Parks’ macarons turned out like Bachour’s, but slightly softer with less chew. The feet were there and the insides were not hollow. While the macarons are good, I tend to get inconsistent results with this recipe and think it might be because of the lack of drying time for the macaron shells combined with not having any of the stabilizing ingredients that Aoki adds to his meringue. Ladurée’s recipe is like Parks’ (again no aging of egg whites), except the egg whites are beaten for less time and a frothy, very lightly beaten egg white is folded in at the end with the almonds and icing sugar. I did not think these had enough textural contrast (they were soft throughout) and were too sweet for me. Feet were present and centers were not hollow. Hermé uses an entirely different technique called the Italian meringue method (previous recipes use the French meringue method). Rather than beating aged egg whites with granulated sugar, Hermé boils the sugar with water and drizzles it slowly in a stream into the aged egg whites while beating them to soft peaks. Hermé also does not beat half of the egg whites in his recipe, instead opting to pour them directly over the ground almonds and icing sugar before folding the mixture in. I had not experimented with the Italian meringue method for macarons before baking these. I was very impressed. The macarons had both the best sweetness level and chew. The feet were nicely developed and the insides were not hollow. Taste-tester consensus was that Bachour and Hermé had the best, yet entirely different, recipes. I preferred the texture of the Hermé macarons, but some others I spoke to liked the Bachour ones more. On the sweetness level, Hermé’s were the clear winner. Bachour’s French meringue-method macarons are quite sweet. They have tall feet and shells that crack nicely when bitten into. They also pipe into circles quite easily. Meanwhile, Hermé’s Italian meringue-method macarons are noticeably less sweet (even though the sugar content is similar, the Italian meringue method leaves some of the melted sugar on the bowl rather than in the batter). The macarons have feet, but they are shorter. The macarons are chewier and are a bit more difficult to pipe into perfect circles. I would recommend trying both methods and seeing which one you prefer. The Italian meringue method, while requiring additional equipment like a cooking thermometer to measure the sugar’s temperature when boiling it, is more difficult to mess up since the meringue produced is more resilient to over-folding. 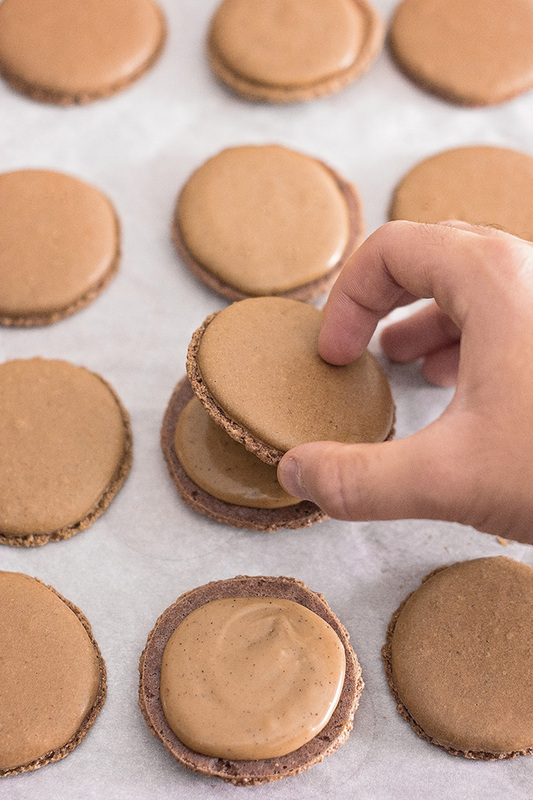 Since over-folding the batter is the most common cause of failed macarons, this is a big plus. Going forward, I will be using Hermé’s Italian meringue method. I just really love the chew and the sweetness level. Below, however, I am sharing both Bachour and Hermé’s recipe. I am also including various tips and tricks I gathered from the other recipes I worked with, including Aoki’s stellar advice on how to properly fold the almond flour and icing sugar into the egg whites. His folding technique is very different from what I have used before, but is truly excellent. Note that the recipes I am sharing are slightly modified versions of the originals. I have made changes that I have found work best for me. Begin by separating the egg whites and egg yolks a week in advance. Place the egg whites in a container, cover with plastic wrap, and using a knife poke a few holes into the plastic. Let the egg whites sit in the fridge for a week before using. 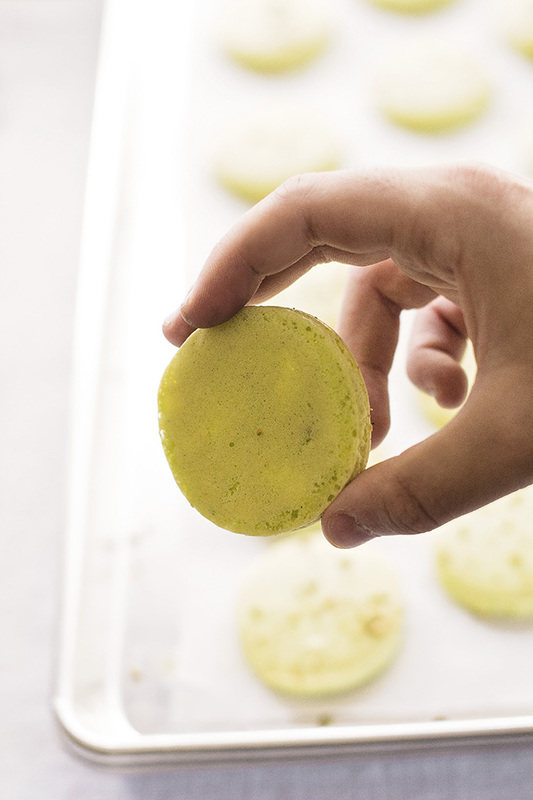 Aging the egg whites weakens the proteins in them and makes macarons with a nicer texture. A week later, take them out of the fridge and let come to room temperature before using. 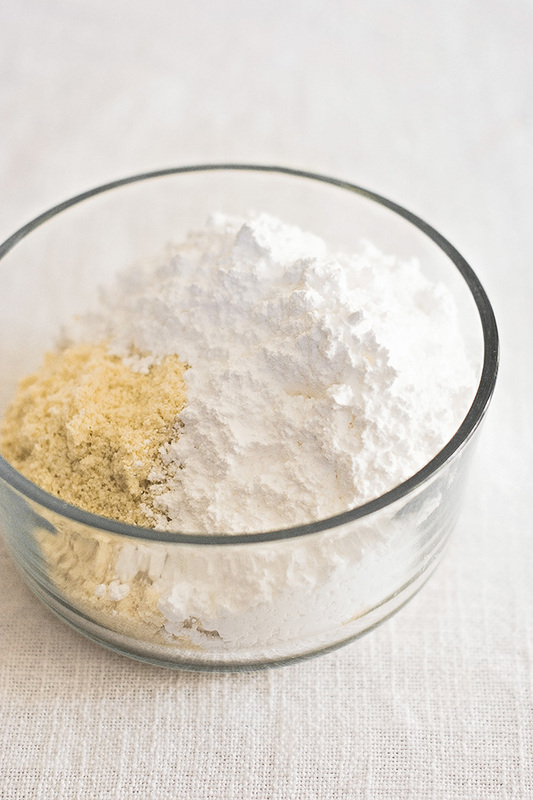 When it comes to almond flour for macarons, I recommend purchasing blanched almond flour. However, if none is available in your area, you can simply grind peeled almonds (with the icing sugar called for in the recipe) until they are very fine. Just be careful that you do not overgrind or you will end up with almond butter. If you do not have access to peeled almonds, you can also blanch almonds and peel them before grinding. In my 2012 tutorial, I provide instructions for how to blanch, peel, and properly grind the almonds. These days, I like to save time and go for the pre-peeled, pre-ground almond flour. It’s so much easier. Buy it if you can. While Bachour just sifts the icing sugar and almond flour together in a large bowl, I first dump both into a food processor/chopper and pulse for about twenty seconds. This helps mix everything together and leads to a more uniform almond particle size. After, be sure to sift everything to remove any large chunks of almond. You can put what doesn’t go through the sieve back and grind some more, but you’ll still eventually end up with about a tablespoon or two of almond flour that doesn’t fit through the sieve. Throw it out. Adding it in will cause cracked shells. Afterward, I beat in the food colouring and the insides of a vanilla bean (but you can use a teaspoon of vanilla extract instead) for about 30 seconds, until combined. Just as I did in 2012, I recommend using powdered food colouring. I do not get good results with Wilton’s gel colours; they are okay but fade in the oven. Whatever you do, do not use liquid food colouring. Using powdered food colouring is a fairly common practice in professional pastry kitchens and is great for bright, bold colours. Aoki uses it in his video recipe and Hermé does too. The next part is the trickiest: macaronage. Macarons are so finnicky that this especially difficult part of making them, where the sifted almond flour and icing sugar is added to the egg whites, has its own name. I used to struggle with macaronage. I found instructions that called for folding the batter “until it flowed like magma” particularly useless. Three things helped me get better. First, I realized the goal was to deflate the egg whites. Usually, with folding, the objective is to be as delicate as possible. That is not the case here. Second, I became comfortable with what the batter needed to look like at the end of macaronage. Ideally, it just begins to flow from the spatula (any more and you’ve overmixed). Everything is well combined and the batter is shiny. Third, watching Aoki’s video (in Japanese) really helped me get the movement right (this one is good too). The trick is to hold the spatula in the bowl but never actually flip it (this is not a regular folding motion). Instead, rotate it in a vertical, perpendicular-from-the-bowl circle going from the center of the bowl to its edge. Push against the edge of the bowl to deflate the egg whites and turn the bowl as you go. Scrape the sides down as needed. This motion works wonders. Add in half of the sifted almond flour and icing sugar and fold until a good chunk is absorbed into the egg whites. You should still see almond flour and icing sugar at this stage. Then, add in the rest of the almond flour and icing sugar. 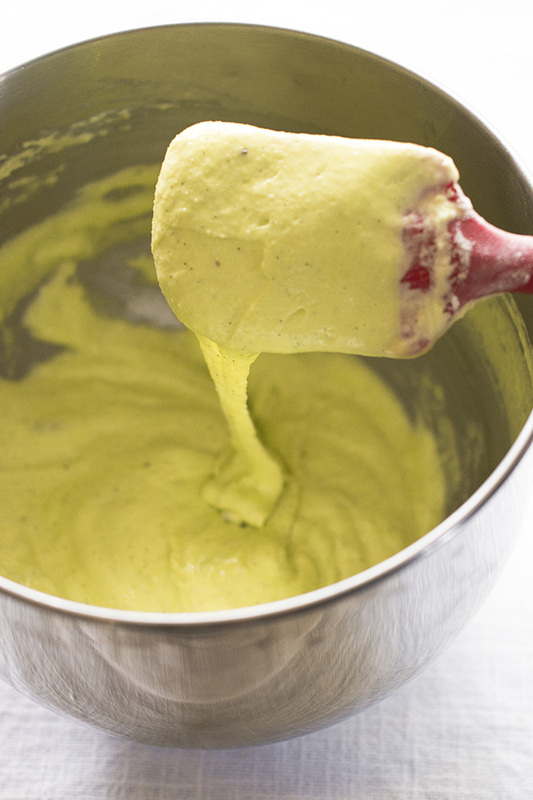 Eventually you will get to a smooth, shiny batter that flows in a ribbon from the spatula. Perfect! Don’t go any further or your macarons will spread significantly after piping. I have recently changed my method for piping macarons. Before, I used a small round tip. Now, I use a massive 1/2-inch in diameter one (Wilton #1A). A larger round tip makes piping perfectly round macarons so much easier. I highly recommend picking one up. Also, try to get a large pastry bag so you can just fill it up with the batter once, rather than filling it up with the sticky batter again and again. Next you’ll pipe the batter onto sheet trays coated with parchment paper (tracing out in pencil 1-inch circles, spaced 1-1/2 inches apart, and then flipping the parchment over is helpful). You can attach the parchment paper to the sheet tray with a dab of the macaron batter at each corner if you find the paper slides around too much. While piping, I hold the bag almost perpendicularly to the baking sheet and quickly lift it up from one macaron to the next to minimize peaks. Pick up the baking sheet and hit it against the counter multiple times to flatten the mounds and pop any large air bubbles. This helps ensure smooth shells and feet. Then, rest the shells for 30 minutes at room temperature. Drying out the tops of the shells means that, in the oven, the egg whites will be forced to expand downward and form feet. While they rest, you can sprinkle some toppings on. Roughly chopped nuts are a popular choice, but once I’ve used cocoa powder. Freeze-dried fruit works nicely as well. Meanwhile, preheat the oven to 275°F (135°C) using the convection setting. Airflow helps ensure even baking. I like to stack two sheet pans together (literally touching each other), with the bottom one empty and the top one with the macarons. I do this because my oven is quite hot on the bottom and macarons need heat primarily from the top to rise properly. An extra piece of metal between the macarons and the bottom heating element helps diffuse intense heat. You might not need to do this for your oven if it heats evenly, but I do. Bake the macarons for 15-20 minutes, rotating the pan halfway through. The macarons are ready when, if you lightly push the side of a shell in the oven, it doesn’t wobble. If it wobbles, keep on baking. Another good indicator of the shells being done is their bottoms become very slightly brown. After the shells cool completely on the baking tray, they can be filled with buttercream, ganache, or jam. Then they must rest in the fridge for 24 hours. This is necessary so the moisture from the filling hydrates the shell. At the same time, the flavour of the filling will enter the shell. 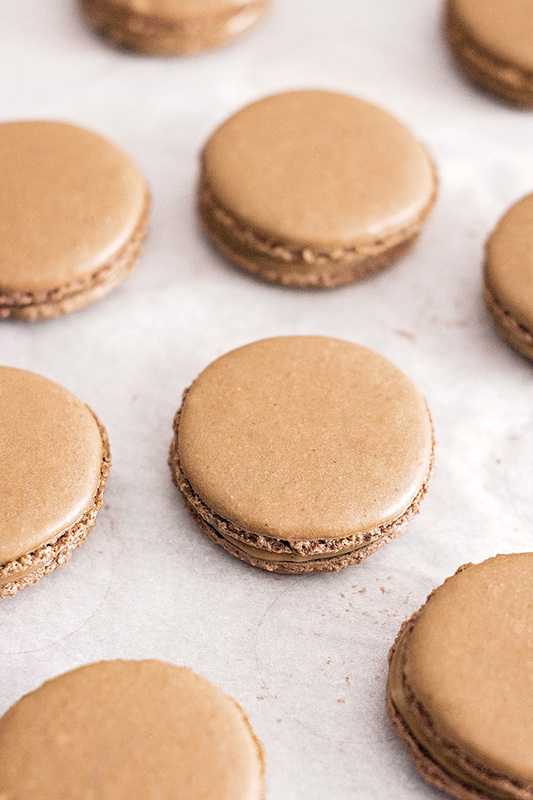 Before eating, bring the macarons to room temperature (about 30 minutes). Hermé’s Italian meringue method for making macarons naturally has some similarities with Bachour’s French meringue method, so I won’t go into a lot of detail for all of the steps again. Begin by aging the egg whites for a week in the fridge and then bringing them to room temperature prior to using, just like before. This time, we’re splitting the egg whites in half. Stir the food colouring and the inside of a vanilla bean (or a teaspoon of vanilla extract) into the first half. 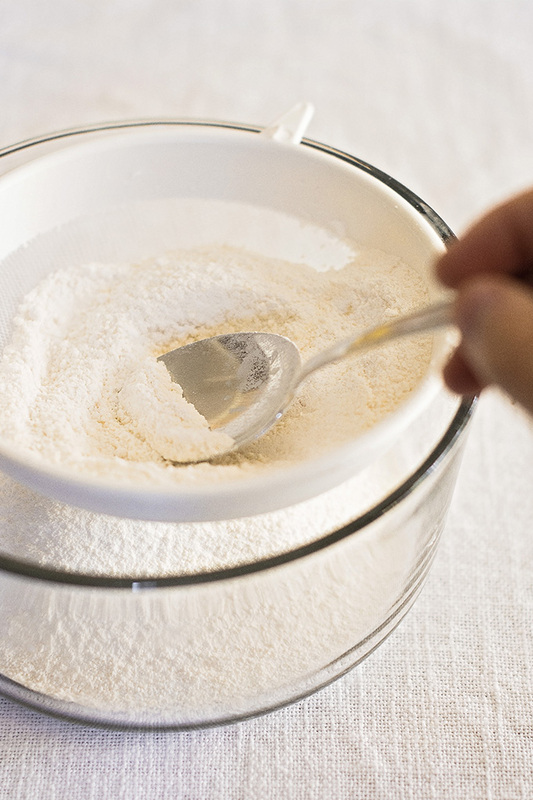 Pour this mixture over the ground together and sifted almond flour and icing sugar, but do not stir. Then, combine sugar and water in a medium sized pot and bring to a boil. 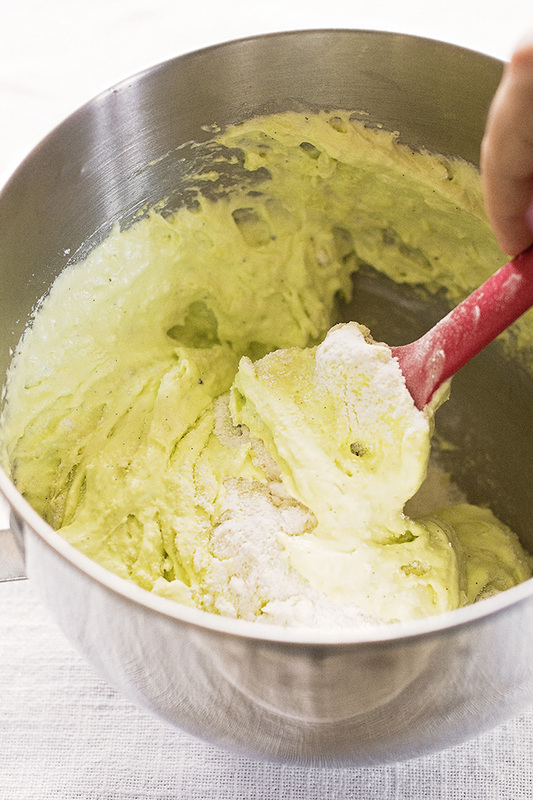 When the sugar reaches 239°F (115°C), begin whisking the second portion of liquefied egg whites to soft peaks. (Hermé calls the aged egg whites “liquefied”.) When the sugar reaches 244°F (118°C), which will be seconds later, remove the pot from the heat and pour slowly, in a steady stream, into the egg whites while continuing to whip. Pour slowly or else you’ll cook the egg whites. Let the meringue cool to at least 122°F (50°C), and then dump in all the almond flour, icing sugar, egg white, food colouring, and vanilla mixture in. 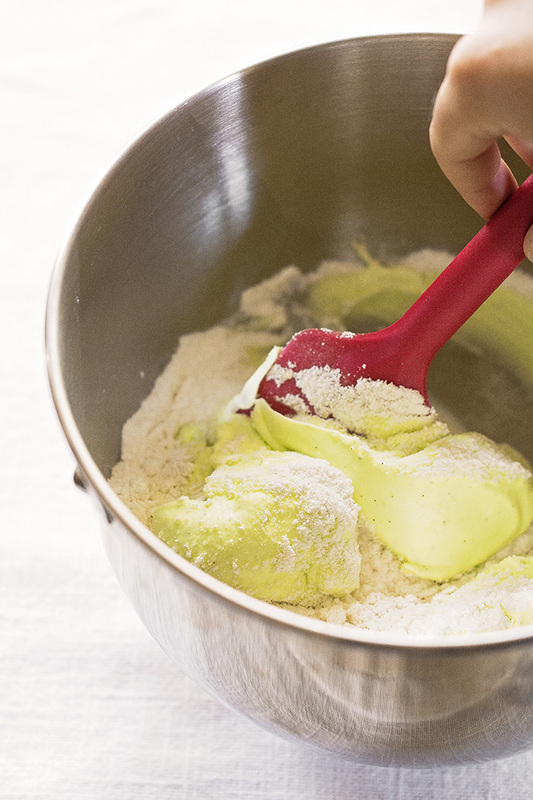 Follow the folding technique described earlier and you’ll end up with a perfectly shiny and smooth macaron batter. Pipe the batter onto sheet pans lined with parchment paper, tap the pans against the counter, and let stand for at least 30 minutes until they form a skin. Meanwhile, preheat the oven on the convection setting to 355°F (180°C). Stack your pans (as described earlier) and bake for about 12 minutes, quickly opening and shutting the oven door twice during baking. Let the shells cool completely on the baking tray and then fill. Let rest in the fridge for 24 hours. Before eating, bring to room temperature (about 30 minutes). And that, ladies and gentlemen, is how you make the perfect macaron. You can find some macaron recipes in my recipe index. I suggest following the instructions for the filling, but replacing the shell recipe with one of the ones described here. The formerly secret recipes of the world's top pastry chefs were compared side-by-side in an effort to find the best French macaron ever. These are the results. Separate egg whites and place in a container covered with plastic wrap. Poke holes in the plastic wrap and place in the fridge for a week. Bring to room temperature before using. Preheat oven to 275°F (135°C) with the convection setting on. Prepare a baking sheet by covering with parchment paper and tracing out 1-inch rounds, spaced about 1-1/2 inches apart, with a pencil. Flip the parchment paper over. Grind together icing sugar and almond flour in a food processor or chopper for about twenty seconds. 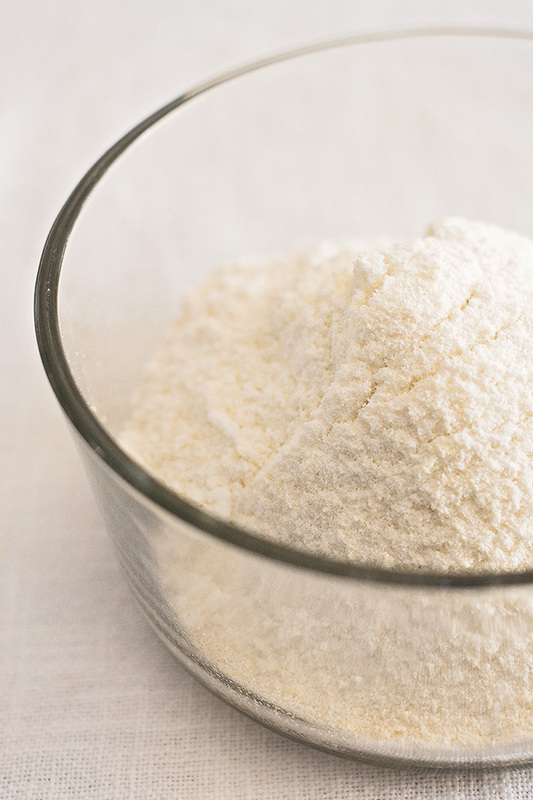 Sift into a large bowl, discarding about one or two tablespoons of almond flour that does not fit through the sieve. 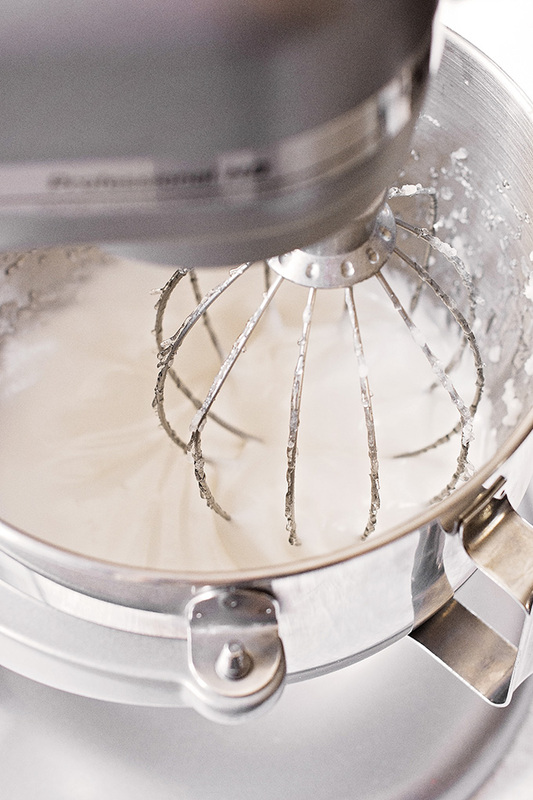 In a stand mixer fitted with a whisk attachment, whip egg whites on medium speed until foamy (about 1 minute and 30 seconds). 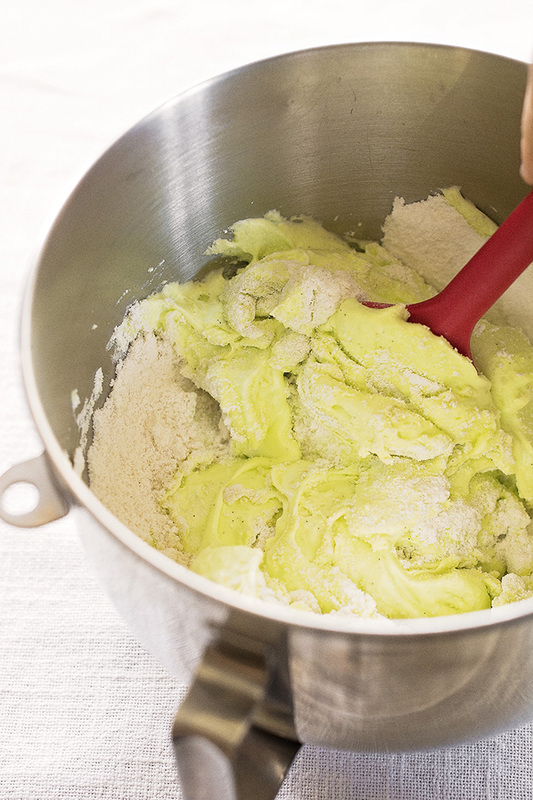 Add sugar slowly, two tablespoons at a time, and whip for 30-45 seconds between each addition. Beat until glossy with medium peaks (about 8 minutes and 30 seconds total). Add food colouring and vanilla as desired and mix to combine, about 30 seconds. With a large rubber spatula, begin folding in half of the icing sugar mixture. This is not a standard folding motion. Never flipping the spatula, rotate it in a vertical circle from the center of the bowl to the sides. Your goal is to deflate the batter, pushing it against the sides of the bowl, while combining the ingredients. Turn the bowl as you go, scraping down the sides as needed. After a good chunk of the almonds disappear into the batter, fold in the remaining almond and icing sugar mixture until smooth and glossy. 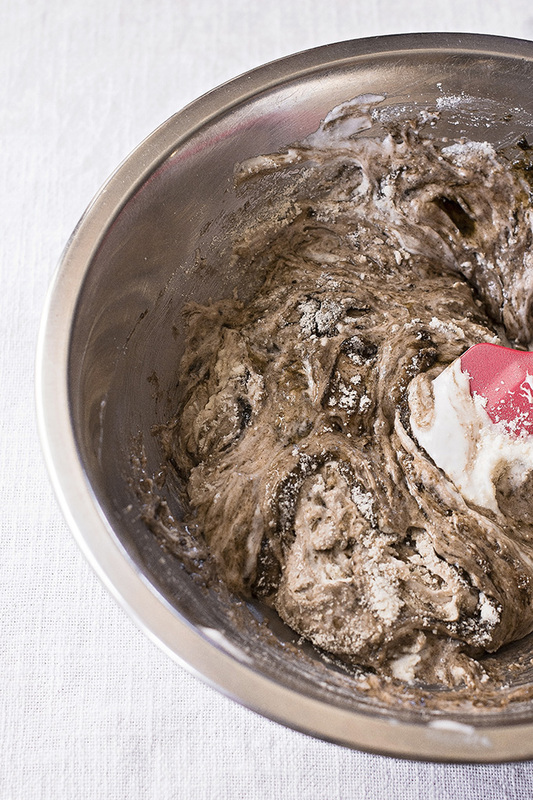 The batter should just begin to flow from your spatula. Do not overfold. 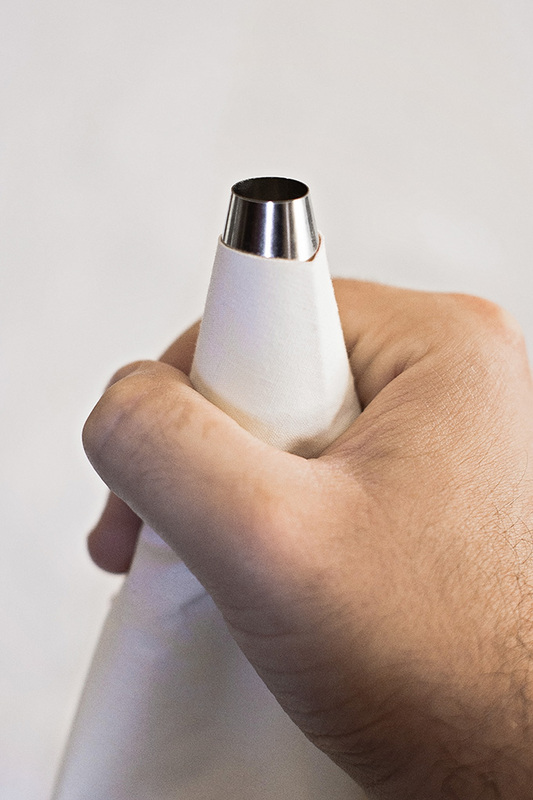 Using a piping bag fitted with a ½-inch round tip, pipe batter onto prepared sheet trays. As you pipe, hold bag almost perpendicular to the baking sheet and flick the tip of the bag as you finish each cookie to minimize peaks. If you find the parchment paper slides around, you can secure it with a dab of macaron batter at each corner. Rap sheets against the counter several times to flatten mounds and pop any large air bubbles. Rest for 30 minutes at room temperature to dry shells slightly before baking. While they rest, you can sprinkle some toppings on if you wish (e.g. roughly chopped nuts or crushed freeze-dried fruit). Stack an identical pan directly underneath the tray with your piped macarons (this increases the thickness of the metal between the bottom heating element and the macarons). Bake, rotating pan half way through, for about 15-20 minutes. The macarons are ready when they do not wobble when you lightly push the side of the shell in the oven. Cool completely before filling. Fill with ganache, buttercream, or jam. Sandwich similarly sized shells together. Let rest in the fridge for 24 hours. Bring to room temperature before eating (about 30 minutes). Preheat oven to 355°F (180°C) with the convection setting on. Prepare a baking sheet by covering with parchment paper and tracing out 1-inch rounds, spaced about 1-1/2 inches apart, with a pencil. Flip the parchment paper over. Stir the food colouring and vanilla into the first portion of liquefied egg whites and pour them over the mixture of icing sugar and ground almonds. Do not stir. Bring the water and sugar to boil at 244°F (118°C). When the sugar reaches 239°F (115°C), begin whisking the second portion of liquefied egg whites at medium speed, ideally with a stand mixer. When the sugar finally does reach 244°F (118°C), pour it in a slow stream into the egg whites while continuing to whisk until the egg whites reach soft peaks. Allow the meringue to cool down to at least 122°F (50°C). With a large rubber spatula, fold in all the icing sugar mixture. This is not a standard folding motion. Never flipping the spatula, rotate it in a vertical circle from the center of the bowl to the sides. Your goal is to deflate the batter, pushing it against the sides of the bowl, while combining the ingredients. Turn the bowl as you go, scraping down the sides as needed. Fold until smooth and glossy. 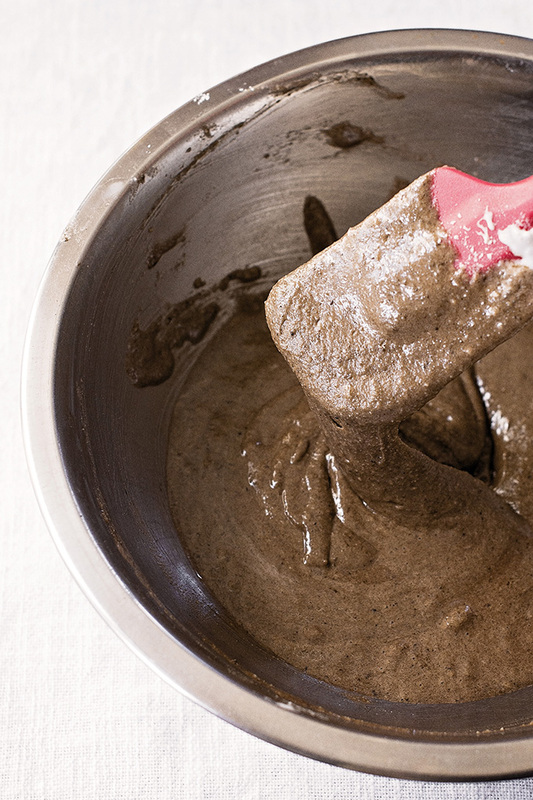 The batter should just begin to flow from your spatula. Do not overfold. Stack an identical pan directly underneath the tray with your piped macarons (this increases the thickness of the metal between the bottom heating element and the macarons). Bake for about 12 minutes, quickly opening and shutting the oven door twice during cooking. The macarons are ready when they do not wobble when you lightly push the side of the shell in the oven. Cool completely before filling. 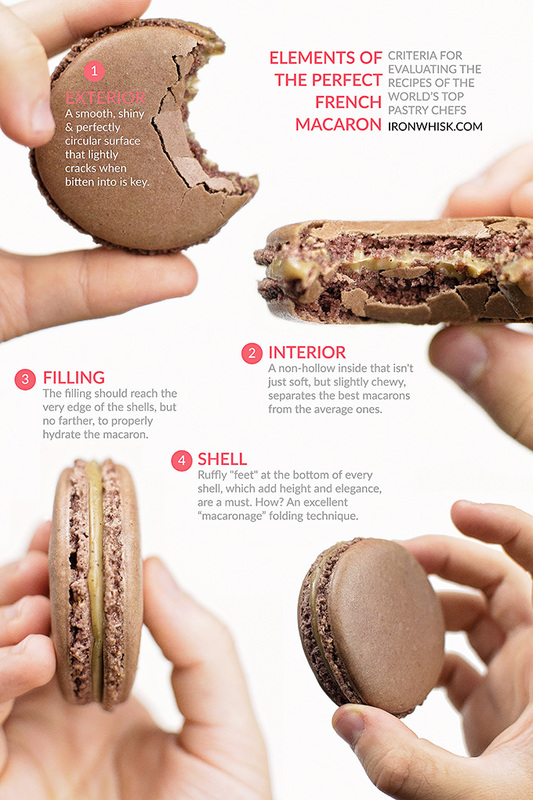 Thank you for the comprehensive guide on how to make macarons. 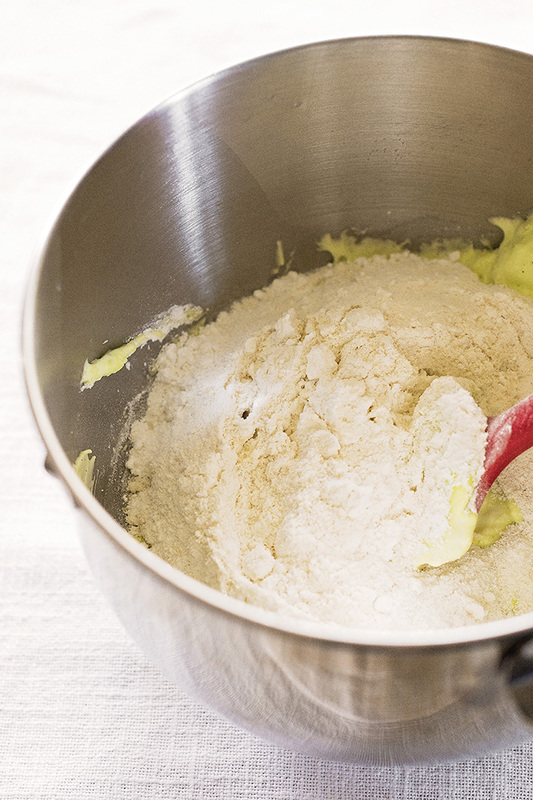 If it’s not too much, could you make a short video folding the almond flour mixture into the egg whites using the Kitchenaid bowl? I tried following Aoki’s technique but struggled using the KA bowl. Thank you! Hi Niqa, you’re right, it’s easier if you transfer the beaten egg whites to a wider bowl. I suggest that if you’re having trouble. I think you can get similar results using just the KitchenAid bowl though… just don’t flip your spatula. Hello, I have tried many recipes for Macarons, both French and Italian meringue, and for some reason the Italian method is the one that works best for me. I tried your recipe (Italian method) and the cooking time doesn’t seem to work. If I bake them at 355F in a double tray for 12 minutes, they loose the shine and the color gets yellowish… I also tried at 300F for 14 minutes and the macaron sticks to the pan (undercooked). Do you have any suggestions? How about Silpat instead of parchment paper? Please help! Have you tried adding freeze-dried fruit to any of these recipes? How would one sift the fruit fine enough to make the shells smooth, and would one add extra egg white to make up for the added ingredient? I’m trying to get strawberry macaron shells right, using the French method, but it’s just not working. I’d appreciate any insight! Hi! Love this post, going to give the French recipe a go ASAP! Just a quick question – how would you add other flavours to the shells without messing up the texture? Or are different flavours best kept for the fillings? Great article. I’ve made a few batches of macarons now using a different recipe with mixed results. I’m anxiously waiting for my egg whites to age so I can try your recipe for the French method. Would it be safe to half your recipe? Nervous about making a full recipe as a beginner. Thank you. Jesus Christ. Now THAT is a blog post. I have only ever had French method work properly for me. I tried Italian once and they didn’t form feet, though they did taste much better haha! This post makes me want to give it another go! Love this content, hope to see more soon!